My third outing with Dirk Pitt adventures. The story begins with an insane person who locks himself in the vault of drowning RMS Titanic. Then the story opens to present day in Russian territory Novaya Zemlya as mineralogist Dr.Koplin discovers that the only Byzanium ore mine has been completely extracted years back. This Byzanium ore is needed for the US top secret Sicilian project. While returning back to his hide out he was shot by Russian, a figure emerges from the snow and saves him, yes, he is our hero, death-defying adventurer and deep sea expert Dirk Pitt. Through Dr.Koplin's statement the Byzanium ore has been mined by Coloradan miners who were hired by Societe des Mines De Lorraine (French government) Back tracking the mining operation they come to know that though they were working for the French, one of the miners Joshua Hayes Brewster who was persuaded by United States, tries to hand over the ore. But the French government comes to know this fact and trails them, 7 out of 8 miners were killed before the ore was transported to Southampton harbour in April 1912. And the ore did not reached US soil and also they did not know the whereabouts of Brewster. The ore rests in the bottom of Atlantic ocean inside the Titanic. The President approaches NUMA (National Underwater Marine Agency) to raise the Titanic. And the team successfully finds the sunken Titanic. At the same time Russian leaders comes to know about the secret project and the Byzanium ore. They send their best man Captain Prevlov with a mission either to sabotage the operation or get hold the Byzanium ore.
Dirk Pitt team raises the Titanic and finds out mole in his team. 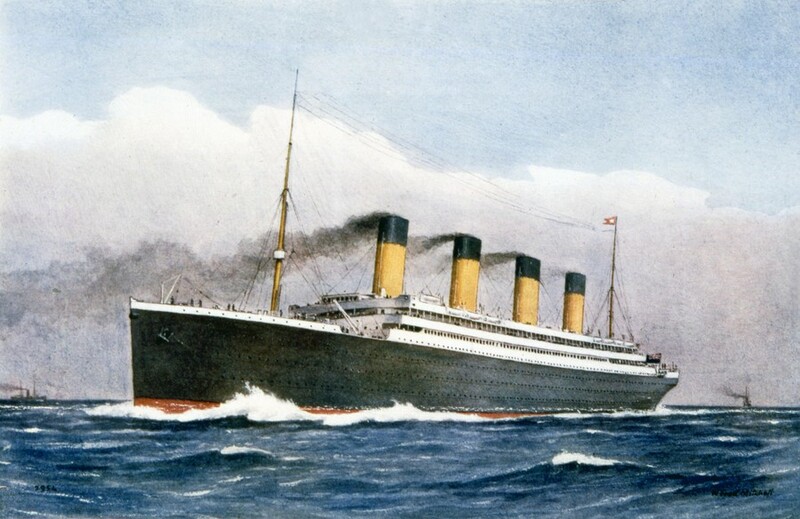 As the Titanic is tugged to New York port, an intense storm hinders their progress. Meanwhile the Titanic is captured by Captain Prevlov. 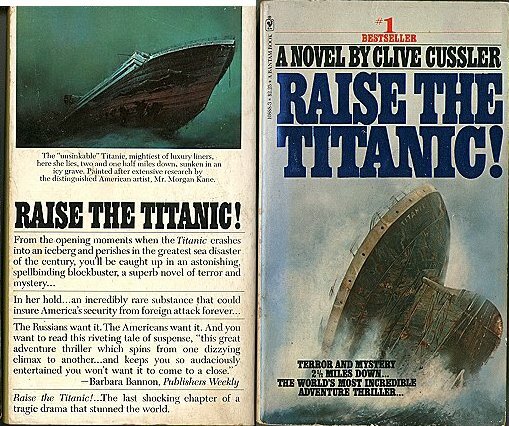 Did Dirk Pitt took Titanic to New York? Did he saved his team from Captain Prevlov? The answers are in the remaining chapters of the book. A superb, fast paced thriller from Clive Cussler. I liked this story than Trojan Odyssey. Lot of characters from 1912 to the present day. The story has couple of sub plots, one is about the marital life of Gene Seagram and Dana. Second sub plot is the classic cold war espionage of Captain Prevlov and Lieutenant Pavel Marganin. And the third is the President of United States. The character Pitt is very intelligent and daring adventurer, his knowledge and approach saves the day. Prevlov: Your name? May I assume that your name is Dirk Pitt? I felt an applause in my mind when I read the above line. Raising of Titanic and the ship completing his maiden voyage after several years, these emotional chapters gave me goose bumps. Thank you Clive Cussler for a fantastic novel, I enjoyed reading the book. It was a great book. The movie not so much. When they found the titanic they were amazed to find the swimming pool still full. 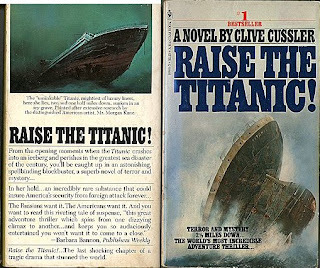 funny that Cussler had a better idea of where the Titanic lay than so called historians. Thank you friends from Clive Cussler collector's Society facebook page. That's the book that got me hooked on Clive Cussler writing, haven't stopped . THE FIST ONE I HAD WAS "VALHALLA RISING, AND THEN IT GOES ON. I GOT HOOK BY HIS ADVENTURES AND THE WAY HE INCORPORATE "THE PAST TO THE PRESENT". IT'S AMAZING . Fantastic story and watched the movie, alas what justice is this to the book. All Clive Cussler fans will agree to your comment.